This weekend I'll be joined by Mitt Romney. The former Massachusetts governor will call in from the campaign trail. 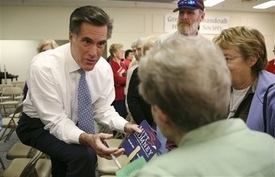 Today Romney predicted support for Rudy Giuliani will fade, opening the door for a more conservative challenger. "Those of us who represent that base will find that we can get that support and ultimately face up one-to-one with Mayor Giuliani," Romney said. "At that point he'll have a more challenging time because I do not believe the Republican Party is going to keep Hillary Clinton out of the White House by acting like Hillary Clinton." CLICK HERE to read more. Also this weekend, the left driving the crazy train: the politics of the California wildfires and another phony soldier denigrates the troops and the left is silent. My guest will be Vin Weber, former Minnesota Congressman and Managing Partner of Clark and Weinstock, on the presidential race and why Obama is picking on Hillary for defending lobbying. Also, an update on NY Governor Eliot Spitzer's plan to give driver's licenses to illegals. This weekend on the radio: When liberals attack! Nancy Pelosi says the most outrageous things! And James "My Name is Earl" Carter strikes again. Plus, Aaron Klein with his new book, Schmoozing with Terrorists. Then, the Clinton Presidency, part deux, hits some snags: a Nobel Peace Prize for that other guy, Mr. Happy pants as an adviser, and why the media eats it all up! And, illegal immigration craziness. Thoughts from a debate I attended, Migrant Air, and the NY driver's license nightmare. This weekend on the radio: So you think you can be President? The Race: Polls, Money; Media. Plus, a new biography of the guy still in office with guest Bill Sammon, author of The Evangelical President. John McCain: The Comeback Kid? Is John McCain poised to become the comeback kid? I'll be joined by the Senator for a LIVE interview from the campaign trail in New Hampshire! If your local station is preempting the program for college football, remember to visit the STATION FINDER section here on the site, for a complete list of stations offering streaming audio of the broadcast. Then, we'll focus on the Democrats, who are finally turning their gun turrets on Hillary. I'll talk about their debate this week, what happened, and why Hillary made the same mistake Rudy Giuliani did last week. And, Mahmoud Ahmadinejad and Hugo Chavez AND Kevin Spacey walk into a bar... Plus, more politics galore and why the Democrats ought to stop having schadenfreude over the GOP's troubles. This weekend on the radio: World War IV. What Kathy Griffin can teach us about the current war. LINK Plus, my very special guest: Norman Podhoretz, author of World War IV. Iowa Polls, Wishing for Failure and Spouses Attack! This weekend we'll talk about who's up, who's down and who's eating the pork chops on a stick in Iowa with guest John Zogby. Zogby is one of the nation's premier pollsters and always has the inside scoop. Then, is success in Iraq breeding a desire to fail? Yup, if you're a Democrat. Plus, Bill Maher goes on with Bill O'Reilly and proves the point. CLICK HERE to read the transcript. And when political spouses attack! I went to see Elizabeth Edwards speak in NY this week---where was our favorite hellcat?! And Michelle Obama takes on the Clinton Ladies' Intervention Team. I hope you'll join me this weekend on the radio! This weekend I'll be talking about what's really going on in New Hampshire, the first primary state. Also, onward, ho! Bill and Hillary hit the road, and Bill shows what he's made of. Plus, why it's no longer life-threatening to be something OTHER than pro-Hillary. I'll be joined by George Gurley from the New York Observer. Then, Obama unplugged! What Obama 's mistake #3 REALLY says! And they won't have Karl Rove to kick around anymore! Join me this weekend on the radio! This weekend on the radio we'll talk about the news media and the president. We'll also take a look at what the latest polls in the race for President really mean, as well as cover Hillary vs. Obama, Chapter Two. Then, the Ames, Iowa straw poll will be happening while we're on the air. We'll cover it, as well as Fred Thompson and the Caroline Giuliani issue.